Sandals in soft vegetable tanned leather. Sizes 16/17 - 24. Vibram® rubber sole. Choose the sandals' color from the photo with the colors and describe it in the "Order details". This product is not subject to our standard return policy. Sandals in soft vegetable tanned leather. Sizes EU 16/17 - 24. Vibram® rubber sole. Choose the sandals' color from the photo with the colors and describe it in the "Order details". This product is not subject to our standard return policy. Sandals in soft vegetable tanned leather. Sizes EU 19/20 - 30. Vibram® rubber sole. Choose the sandals' color from the photo with the colors and describe it in the "Order details". This product is not subject to our standard return policy. Sandals in soft vegetable tanned leather. Sizes EU 25/26 - 34. Vibram® Superflex rubber sole. Choose the sandals' color from the photo with the colors and describe it in the "Order details". This product is not subject to our standard return policy. Indoor slippers with a garter fastening. Sizes EU 16/17 - 39. 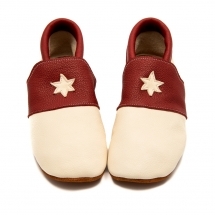 Vegetable tanned leather & soft suede sole. This product is not subject to our standard return policy. Outdoor shoes with velcro fastening. Sizes EU 16/17 - 24. Genuine vegetable tanned leather & Vibram® rubber sole. Indoor slippers with a garter fastening. Sizes EU 16/17 - 39. Vegetable tanned leather & soft suede sole. 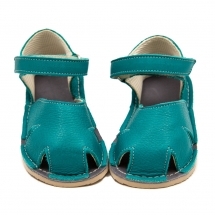 Sandals in soft vegetable tanned leather with lining. Sizes 16/17 - 24. Vibram® rubber sole.Choose your best width!